The Stored Solar plant in Jonesboro. 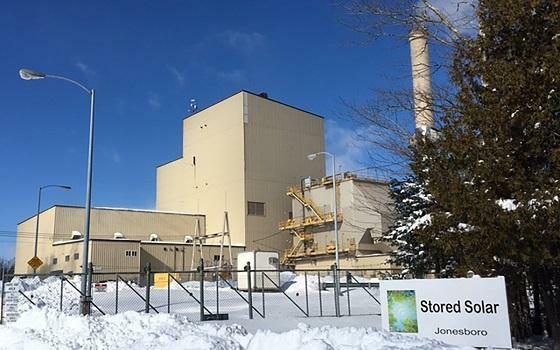 The Maine Public Utilities Commission voted Wednesday to approve a $1.2 million taxpayer subsidy to an embattled biomass company operating two plants in West Enfield and Jonesboro. The vote by the three-member commission largely followed the recommendation of PUC staff, which found last month that Stored Solar LLC met only one of its three contract obligations, while falling well short of the other two. It maintained the agreed upon number of jobs, but purchased less than 40 percent of the waste wood it promised, and it spent $1 million less on capital expenditures than it was supposed to. Some lawmakers said the $1.2 million subsidy should be reduced further based on that performance. But during deliberations held Wednesday, PUC chairman Mark Vannoy said the payment is far less than Stored Solar could have received. "If the plants had operated at full capacity, and Stored Solar met all its contract criteria, the payment would have been $4.6 million," Vannoy said. "Instead, it's $1.2 million, which is a reduction of roughly 75 percent." Stored Solar has been under intense scrutiny since winning the subsidy contract late in 2016. Logging contractors reported a rash of late payments throughout last year. And, this year, a bill was introduced that effectively voided its contract while calling for an investigation. Some lawmakers have also questioned whether the company should have ever qualified for the subsidy program following an examination of the 2016 biomass bailout law by Maine Public Radio. But so far, the scrutiny has yet to yield legislative action.